(Stage 1-14): 16 days, 315 km's pilgrimage (199 miles). There is a popular saying that states, “Whoever comes to Santiago and does not come to San Salvador, the Cathedral of Oviedo, visits the servant, but forgets the Lord.” The Camino Primitivo has its origin in Oviedo and connects to the Camino Francés in Melide, which you will follow during the last couple of stages to Santiago de Compostela. Camino Primitivo is Spanish for "Original Way." It is called this because it was the first pilgrimage route with historical reference and is thus described as the oldest pilgrimage route to Santiago de Compostela. In the 9th century, King Alfonso II of Asturias travelled from his residence in Oviedo to Santiago to visit the tomb of St. James, which had been discovered a few years earlier. The route that the king took is well documented and the path he folowed is largely the same as the "Camino Primitivo" today. One of the notable characteristics of this route, however, is its level of difficulty. It is significantly hillier than the French Camino, especially between Oviedo and Lugo, where you will find yourself constantly hiking up or down. There are a limited number of pilgrims on this fairly unknown route. In fact only about 3% of all pilgrmis arrive in Santiago via the Camino Primitivo, which is why it is perhaps the most pristine and charming. Of course, besides meaning "Original," this route's name also means primitive, in the sense that there are significantly fewer villages, restaurants and good hotels along this route compared to the other pilgrimages. Therefore, it doesn't allow as much flexibility in modifying the stages as we do with the other routes. Still, we have made this trek most rewarding with careful planning. We've included in the price a picnic that you pick up each morning before leaving the hotel (after Melide the picnic isn't included since the Camino Primitivo joins up with the Camino Francés and there are innumerable possibilities at your disposal). In summary, despite its challenges, you can expect generally good and authentic accommodations at every stop. On the Camino Primitivo the beauty of the countryside and nature awaken all of your senses. You will walk through some of the least populated areas in all of Spain, crossing dozens of forests, rivers, streams, pasturelands, valleys, hills, mountains, and villages. You will hear the sounds of nearby animals and birds singing more often than the usual, "Buen camino" and "Hola." This segment, especially through the Asturian landscape, is fabulous. For the person who is physically prepared for the level of difficulty involved, this route is without a doubt, one of the loveliest available. Besides stunning nature, this trip also offers significant urban life and culture. We definitely recommend adding one more day to stay in Oviedo, to see one of Spain's most beautiful cities with its fortress castle and charming Old Town filled with history and atmosphere. Later, you will also pass Lugo, where you won't want to miss the world's best-preserved Roman walled city. Finally, by the end of your journey, you will joyfully arrive in Santiago de Compostela, a jewel in every way, marveling at this city that speaks for itself. It's an unforgettable moment and surely you'll find the word "Rejoice" on your lips! 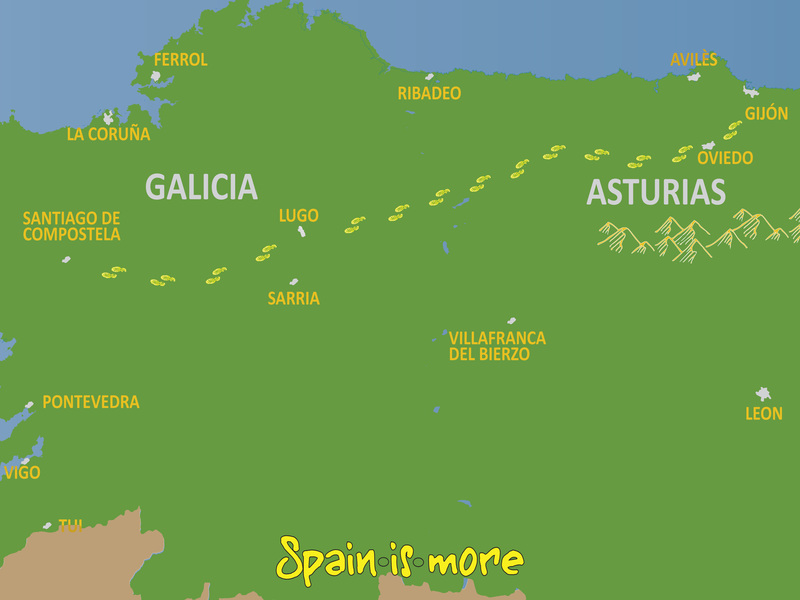 Do it now before everyone else (re-)discovers this amazing and beautiful camino-walk. There are a limited number of pilgrims on this fairly unknown route. In fact only about 3% of all pilgrims arrive in Santiago via the Camino Primitivo, which is why it is perhaps the most pristine and charming. You will probably arrive via the high-speed from Madrid to Oviedo, depending on where you come from. Spain is More can include your airfare and/or local transportation upon request. The Asturian capital of Oviedo is an elegant city, both in its architecture, its variety of restaurants and its cultural scene, which is among the most-recognized in Spain. The city's history dates back to 761 and much of the old town is marked by its long history. Since the Middle Ages, the city has been a popular destination for pilgrims who visited the San Salvador de Oviedo Cathedral. As a kingdom Asturias has a long, exciting and glorious history. The Spanish successor to the throne bears the title of "Princess of Asturias" until her coronation. This is partly due to Asturias’s important role in the war against the Moors, and thus the creation of the Spain we know today. But the king also had an important role in relation to the pilgrimage route through Spain. In the 12th century. King Alfonso II made the first known pilgrimage to what was then called "Campus Stellae" (Compostela), to found the Cathedral of Santiago, which was meant to hold the remains of the Apostle James ("Santiago" in Spanish). It was the king who subsequently spread the word about this pilgrimage, which is today considered one of the three most important Christian pilgrimage routes in the world. From the Cathedral El Salvador the Camino leaves Oviedo and quite quickly you will find yourself in a rural setting which will by typical of the next several stages. This stage is characterized by passing through relatively many villages along the way, and it is clear that the nearby highway is the lifeblood of the area. The difference is clearly seen when the highway ends at about stage 1 - 1,5 later. A beautiful hike through typical Asturian landscape with soft, green hills in rural location. The stage is the easiest on this side of Lugo and it follows, for the most part, the banks of the Nonaya River. The village of Salas is filled with history, with its beautiful stone houses, a church from 1549, a palace and a singular tower. The village was declared "protected” in 1994. From the beginning of today's stage, you will have a gentle but long climb to the city of Tineo. When you reach the ridge you will have an incredible view of the valley, and the last miles before Tineo are pure pleasure with green hills as far as the eye can see. Tineo is a relatively large mountain village with good restaurants and a few shops, etc. During this stage, you will constantly be on your way up or down. It is one of the most difficult stages. At the same time, it’s one of the most beautiful and most deserted stages of all Camino de Santiago stages. This stage is the toughest on the Camino Primitivo, as you must pass the Puerto del Palo (1,120 meters), and because the stage is long and unfortunately cannot be shortened. However, it is possible to take a taxi the first 7 kilometers from Pala de Allande to the top of the Puerto del Palo, from where the stage is much easier. In terms of scenery: beautiful. From Grandas de Salime the Camino continues through the beautiful landscape. The terrain is easier even if a couple of hills must be passed, when you dross from Asturias to Galicia. This is a difficult – mainly due to a couple of tough climbs – but generally hilly stage, in particular, the one-kilometer ascent from A Lastra, which has the highest grade of ascent on the Camino Primitivo. The terrain becomes somewhat more level as you get closer to Lugo. This stage can be shortened to 8 and 23 kilometers by extending the trip with an extra night . Lugo's greatest treasure (and what a treasure it is!) is its 2 kilometer long, 8-12 meter high and more than 4 meter wide Roman city wall from the third century (1.25 miles long, 26-40 feet high and 13 feet wide). The wall is well-preserved and its dimensions are impressive. It is the best-preserved Roman city wall in the world and a stroll on it is a majestic experience that offers stunning views of the city. The second most important monument is the Cathedral of Santa Maria. Around the cathedral you will find narrow streets that criss-cross the Old Town, creating a pleasant and cozy atmosphere. The stage is the easiest so far, which is perhaps quite welcome. You've come down from the heights and have thus returned to the forest and are closer to rivers and lakes. The area is rural with fields and small farming communities. An idyllic stage. This final stage of the Camino Primitivo on the route links up with the French Camino for the last three stages prior to Santiago de Compostela. In many ways, the stage is similar to yesterday's stage, passing mainly through woods and fields. On the French route, you will meet several walkers and cyclists and also a far greater range of restaurants, larger villages etc. than you have been used to. Although there are no hard climbs on the stage, it is ascending and descending constantly, but not, however, to the same extent as you are used to by now. Congratulations, you achieved an admirable goal, so it's time for a number of traditional pilgrimage rituals. First, be sure to get proof of this feat: the last stamp in your pilgrim passport. Along with the rituals, enjoy the End Station of the Pilgrim route, Santiago de Compostela, which offers a veritable cornucopia of attractions and one of the world’s most important cultural centers. This university town exudes charm and has a myriad of cozy streets offering ample opportunity to sample the many local delicacies. The cathedral is surrounded by a historic center which is on UNESCO’s World Heritage Site list, and old town is incomparable. Its monuments stand as true works of art in different architectural styles. From 945 Euro/pers. Per person in a double room. 10 x lunchpack - from Oviedo a Ferreira. Train from Madrid or Bilbao to Oviedo. Personalise your Camino: Extended stays, divide stages, transportation from starting point from anywhere in the world and back. Please ask us, we will be happy to assist you. Baggage Transport on the pilgrim route can be purchased. If you buy a luggage service your bag / suitcase will be transported from hotel to hotel on the scheduled days of hiking. Price 95 €/unit of max 20 kg.